Bushman Equipment, Inc. manufactures a wide variety of custom engineered lifting devices to meet the roll handling needs of the paper, textile and other industries. This equipment is custom designed to perform a wide variety of operations safely and efficiently while providing coil protection and preserving the integrity of even the most fragile roll. Bushman Equipment, Inc. roll lifters, like all our lifting equipment attachments, are designed and manufactured to meet or exceed the latest revision of ASME Spec. 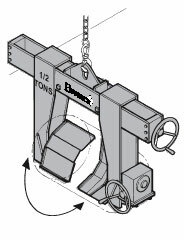 BTH-1: Design of Below-the-Hook Lifting Devices. C-hooks can transport large mill rolls when the lower member is inserted into the core of the roll. Core lifter c-hooks feature ergonomic designs that provide efficiency, durability and safety, c-hooks come in a variety of configurations to permit the greatest utility in all roll handling operations. 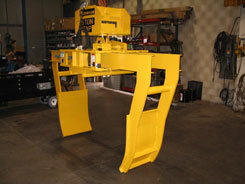 Upenders rotate coils and rolls in either direction up to a maximum of 90 degrees. Capacities are available up to 50 tons, as are a variety of options including motorized horizontal base rotation and hydraulic drives for automatic material handling. Bushman Equipment, Inc. designs and manufactures a wide range of specialized roll lifters that combine safety, operating efficiency and protection of the coil or load. Roll tongs are specialized tools that handle rolls of paper, steel rolls, wire and many other materials. They vary from light duty to mill duty lifters. 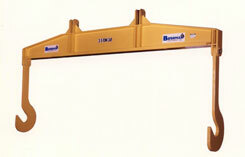 Model 415 spreader beams, or load beams, are frequently used as paper roll lifters. 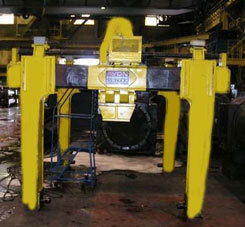 These spreader beams have J-hooks that engage a shaft that has been inserted in the core of the roll. Hooks are at a fixed location. 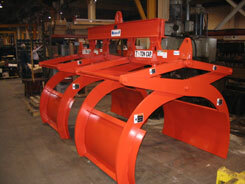 Model 415 spreader beams are available with capacities from 50 pounds to 80 tons. 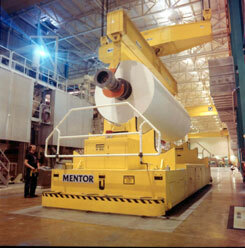 This spreader beam transports large paper rolls in a major paper mill. 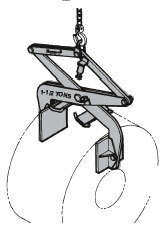 Motorized rotating spreader beams handle large rolls by engaging the core shaft with J-hooks. 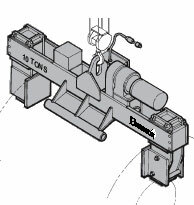 The design features double beam construction with powered rotation to turn the roll in the horizontal plane for positioning, another example of automatic material handling. 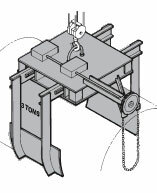 These spreader beams also have J-hooks, however, the distance between these hooks can be adjusted to accommodate a variety of roll and shaft lengths. Quick release pins lock the hooks at various positions. These units are available in capacities from 50 pounds to 40 tons. For complete information, please see Spreader Beams. 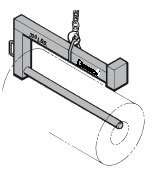 Model 600 C-hooks are ergonomic paper roll lifters that have a round carrying member that fits into the core of the roll. Capacity is limited by the core diameter and roll width. For more information, please see C-hooks. 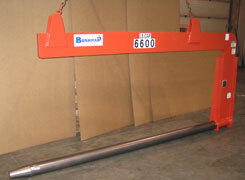 Model M9604 upenders provide a safe and efficient means of upending rolls. 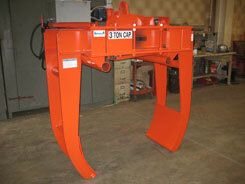 Upenders can handle very heavy loads with capacities up to 50 tons. A variety of options including motorized base rotation and hydraulic drives are available for more automated material handling. For more information, please see Upenders. 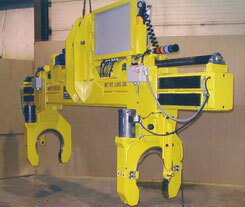 Model M2028 motor driven roll lifters have telescoping legs that engage the core of the roll. 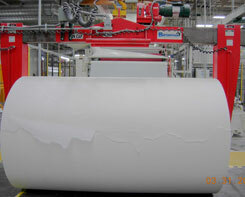 They handle rolls of varying widths and capacities from one to 20 tons, depending on the core size. A manual model, operated by a hand-wheel or chain-wheel, is also available. 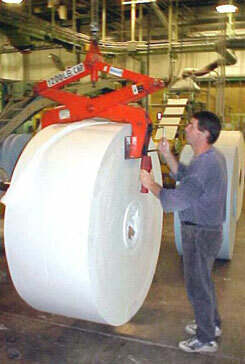 This paper roll clamp with a capacity of 6,000 pounds is used as roll lifting equipment by a major paper mill. This custom designed motorized back up roll and chock lifter was designed to simplify the process of removing or installing the backup roll assemblies into or out of a rolling mill at a major North American steel mill. This specialized roll lifter saves the maintenance personnel from having to climb a ladder to connect or disengage the overhead crane, thereby reducing the possibility of an accident. The legs are powered into the existing holes on the chocks. Each leg has sensors to ensure that the pin is fully engaged in each hole and that the leg is in this correct position prior to giving permission to hoist the assembly. 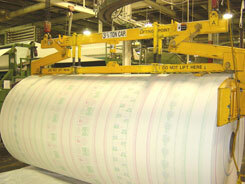 This 90-ton capacity finishing roll lifter handles mill rolls in a fully automated roll grinding cell in a steel mill. This unit is specifically designed for lifting clean or dirty rolls in and out of roll grinders and storage racks. It features travel in and out to find the correct lifting position on the roll neck. The horseshoe is powered in a radial direction allowing this unit to be lowered directly on the roll neck, if required, without having to travel in over the ends of the rolls. This can be used either manually or in fully automated systems. 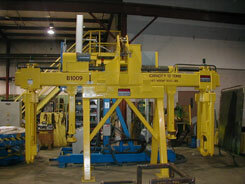 We also custom build manual units to move both dirty and finished rolls and roll assemblies with chocks. This unit is designed specifically for lifting clean or dirty rolls in and out of roll grinders and storage racks. It features in and out directional movement over the ends of the rolls to find the correct lifting position on the roll neck. This can be used either manually or in fully automated systems. Model 2038 rotating axis grabs grip the OD of the roll to change its axis by rotating it about its center of gravity. 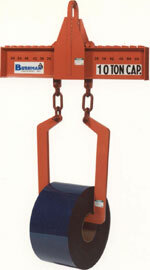 This lifting device can be operated manually or powered by electric or air motors. This unit works best in applications where the roll is packaged, banded or otherwise secured from telescoping. Model M2050 roll clamps are motorized grabs that handle rolls by gripping the ends. This unit can handle a wide range of lengths and capacities up to 20 tons. Manual units are also available. Cradle rolls of varying sizes by gripping them around the OD. Manual units are used to handle smaller loads; motorized units are required for loads that are heavier or have larger diameters. 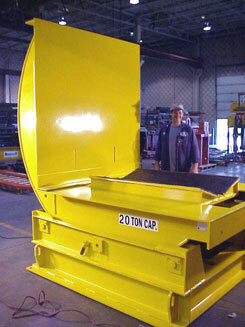 Capacities up to 20 tons are available. 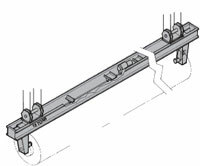 This double roll tong grab is used as paper roll handling equipment. 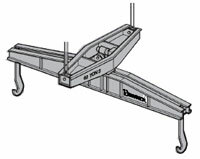 Pressure lifting tongs are frequently used to handle paper rolls. This grab is equipped with handles. Left: Model 1070-U pressure lifting tongs are designed to handle rolls of a constant length by gripping across the ends of a roll. Non-marring protective coverings are available for the pickup pads. Center: Model 1529 double tongs are gripping tongs that have two sets of legs rather than one. They are designed to handle longer loads. Right: Model 1070-BB pressure roll tong grabs handle rolls of varying length (up to 25% variation) by gripping across the ends with pivoting pads. Protective covering is available for the pickup pads. For complete information, please see Lifting Tongs.